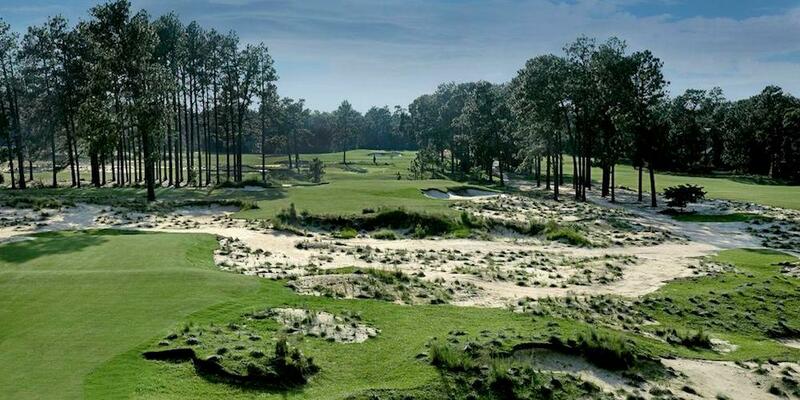 Pinehurst Resort & Country Club will unveil a completely reimagined No. 4 course on Sept. 20, the work of renowned golf course architect Gil Hanse. Visually stunning from tee to green, exposed sand areas, vast cross bunkers and native wire grass meld with the site's rolling topography and natural ridge lines to create dramatic vistas and strategic options on every hole. Hanse's design of No. 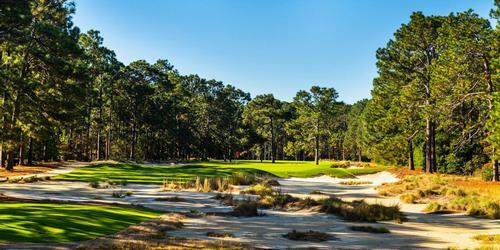 4 is a brand new and bold expression of pure, timeless Carolinas Sandhills golf. "We've returned the original landscape to the course, and from there, we then created the features, slopes and green locations," says Hanse, architect of the 2016 Olympic Course in Rio de Janeiro. "We believe golfers are going to appreciate how No. 4 fits into the Pinehurst lineup and elevates the entire golf experience." The par-5 9th hole is a shining example of how No. 4 has been reinvented through Hanse's vision and touch. More than 25 pot bunkers are replaced with sprawling, sandy native areas, and a massive crossbunker spans the width of the fairway, connecting with nearby holes and tying together the natural landforms. Green complexes throughout the course have been lowered to fit the landscape, and are complemented by Hanse's unique bunker designs. "Among Pinehurst's nine golf courses, No. 4 has always held a special place in the resort's history," says Bob Dedman, Jr., in speaking for the Dedman family, the owners of the resort. "We entrusted Gil and his team to interpret and execute the vision of making No. 4 more natural and authentic to the Sandhills of North Carolina. 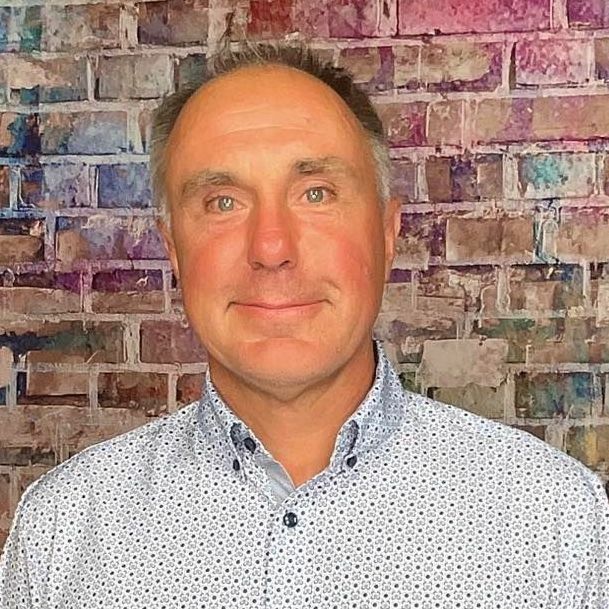 Gil, Jim and the team have been great to work with and have far exceeded our expectations." "No. 4 is a companion in the landscape, but it is not a tribute to No. 2 in the features," Hanse says. "The greens are different, the approaches are different and we wanted to take advantage of the landforms, which are much more dramatic than those on No. 2." Completion of No. 4 is bittersweet for Hanse, who spent parts of the past two years onsite with partner Jim Wagner and his construction crew, "The Cavemen," working both on No. 4 and Pinehurst's short course, The Cradle. He describes living in the Dornoch Cottage - Donald Ross's home in Pinehurst - as "one of the most meaningful things that has ever happened to me." The reimagination of No. 4 is the latest in a series of bold moves for one of the world's most iconic golf destinations. The restoration of No. 2, acquisition of No. 9, the opening of The Cradle and an expansion of the 18-hole putting course Thistle Dhu are complete, as are restorative enhancements to Pinehurst No. 3. 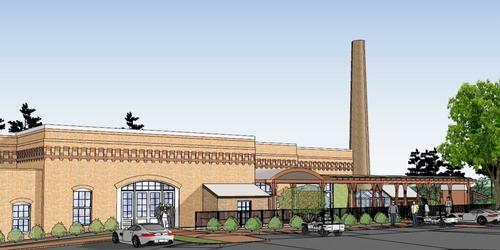 The Pinehurst Brewing Company will open this fall, located in the village's historic steam plant. "There's never been a more exciting time to visit Pinehurst," says Tom Pashley, President of Pinehurst Resort. "All of the recent changes and enhancements have resulted in a new energy level and fun factor that's contagious. I can't wait for visitors to see the stunning transformation with the new Pinehurst No. 4."